Gifts for outdoorsy folks? Grab them a fleece. Knitting enthusiasts? Grab some crazy yarn. But what about gifts for bloggers? WordPress nuts? SEO slaves? Affiliate marketing gurus? Side hustlers? (It’s ok if you don’t know what these words mean. We’re here to help😎). Pro Tip to save cash: Make sure you’re using both Ebates and Swagbucks to save money while shopping online. Between these, you can often get up to 20% cash back from places like Amazon, Wal-Mart, and more. There are plenty of amazing reads for bloggers to help them grow their audience and learn! CREATE Blog and Editorial Planner: Create Exceptional Content, Get More Done and Smash Through Your Blogging Goals – Honestly? This book is GOLD. Highly, highly recommended for any blogger–regardless of where they’re at on their journey. Meera Kothand has written a lot about blogging! The 4 Hour Work Week by Tim Ferriss – THE go-to book for any online entrepreneur and blogger. This is a life-changing book. Purple Cow by Seth Godin – One of the best marketing books of all time. How to Blog for Profit by Ruth Soukup – The top-selling blogging book of all time. It’s practical and actionable! Secrets for Blogging Your Way to a Six-Figure Income by Problogger – A story and guide by one of the most successful bloggers ever, Darren Rowse. Anyone who works at a computer should invest in a decent pair of earbuds or headphones. Good news is….you CAN get a decent pair for less than $9. The Panasonic Ergofit Earbuds ($9) are absolutely incredible, but if you feel like splurging a bit more, go with the Sennheiser HD 206 Over Ear Headphones ($29). Snazzy! December 2019 Update: Better Ways to Charge Gadgets! I’m not joking when I say that a good portable charger can change your life. I HIGHLY recommend these as Christmas gifts–they’re incredibly useful for everybody and affordable! Jackery 6,000 mAh Portable Charger – If you can spend $10 more–upgrade to the 10,000 mAh version. It’s what I have and I LOVE IT. POWRUI Multi-Wall Outlet Surge Protector – 4 USB plugs? Yes please. First, ask your blogger if they’re on WordPress. If so, write “5 Pro WordPress Themes” on a piece of paper and wrap it. Sit down together with your blogger and pick out the themes! For laptop users, the computers overheat on your lap and can get uncomfortable. Laptop desk and lap stands are affordable and effective. The Amazon Laptop Stand ($19) is super easy, but the Rain Laptop Stands are bar-none. (It’s also rated 5/5 stars on Amazon, which is rare). Distractions stink when you’re trying to get stuff done! Our personal favorites are Freedom.to ($30/year) and Hey Focus ($20) (Mac only). Both of these can block social media sites, etc to force your blogger into, ya know…blogging. No explanation needed, right? May we suggest Death Wish, The World’s Strongest Coffee($19)? Or for mere mortals, how about a tea variety box($11)? These are pretty handy for everyone, but especially those of us constantly creating images, graphics, videos, and content for our blogs. These are incredibly cheap these days. Grab a metal Samsung 32gb for $14. This is an excellent gift idea. Bloggers = writers, and getting an app specifically designed to enhance the writing process can make a world of difference. We use Bear Pro ($15/year and FREE!) for all-things brainstorming and writing, but Evernote ($40/year and FREE! )is still the gold-standard for organizing notes, to-do lists, writing, and pretty much everything you can think of. This might seem like an odd gift for a digital-enthusiast, but a physical journal provides a much-needed break from computer screens. You can start basic with an Amazon Basic Journal ($9), nerd out with the Traveler’s Notebook ($25), or grab a more guided journaling experience with The Freedom Journal ($39). 9 – Gift Cards ($$-$$$) Let’s be honest, this is the easy AND effective route. You can never go wrong with an Amazon gift card, but you can also get discounted gift cards at places like Gift Card Granny. Silly name, but it’s an amazing resource to save a few bucks during the holidays! This is more fun and quirky, but we’d sure love a Do You Even Blog Podcast mousepad. Shutterfly is easily the fan-favorite for customized…well, anything really. Managing social media can be a pain, but luckily there are fantastic (and affordable) tools to help with this. Buffer ($120/year) is widely-used, but SmarterQueue ($20/month) is actually our platform of choice. It has just as many features as MeetEdgar ($50/month, it’s arch rival), but at half the cost. Click here to get a double-length free trial! If your blogger uses Pinterest, grab them Tailwind. It’s the gold standard. This is the single most valuable blogger gift idea in this entire guide. 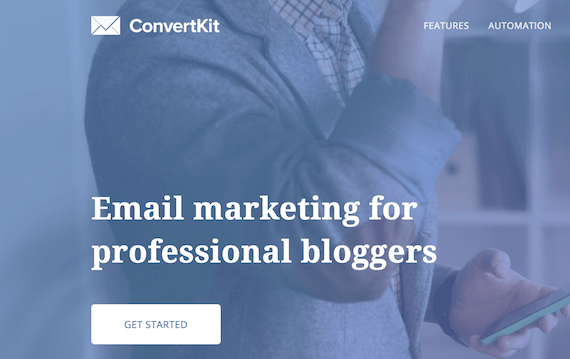 Email marketing is crucial to the success of any blogger, and while there are dozens of platforms on which to host your newsletter, ConvertKit ($29/month) is the only one specifically made with bloggers in mind. If you really to support your blogger loved-one, grab her a ConvertKit subscription, a book, and one of the online courses below. You’ll be her favorite relative by FAR. Another must-have tool for blogging is the ability to capture email leads. Sumo ($29/month to FREE) is the gold-standard for blog marketing tools. The amazing thing about Sumo is, it’s a whole suite of products for that price. It’s just about every marketing tool a blogger would need. SO worth the money. Laptop bloggers often carry around a LOT of stuff. Journals, USB drives, External SSDs, Miss, Webcams, Chargers, and more. Their gear is expensive, so a solid bag is essential. For anyone with lots of gadgets (mics, webcams, etc), the Case Logic DSLR bag ($63) should do the trick. For a more stylish and less gadget-y bag, try any CoolBELL messenger bags ($50). Canva and Picmonkey are both fantastic and widely-recommended, but we use Snappa ($15/month) for our own blog images and graphics. Their tools are incredible, and it comes with 200k+ free stock photos as well! Recording quick explainer videos, annotating screenshots, and sharing them has never been easier with CloudApp (FREE to $8/month). The best part? All those files are NOT hosted on your computer, they’re hosted on…well, the cloud. This is a really fun gift idea for your blogger. If there’s ANY video involved, a decent webcam is mandatory. The Logitech C920 ($49 on sale at the time of this writing!) is the only choice. It’s the gold standard, and it’s affordable. If your blogger does a lot of video, grab them a cheap light! It helps more than you’d think. The tiny Neewer LED ($33) is fantastic, as are the LimoStudio Umbrella 2-kit ($52). Michelle makes over $100,000 a month from her blog. Yes, you read that correctly. Her course, Making Sense of Affiliate Marketing ($197), is a crash course on using affiliate marketing, in connection with a blog, in order to generate side-income (or full-time income!) It’s highly regarded as one of the best online courses for generating blog income. This is THE course for new-ish bloggers in their first year (also great for those who haven’t started a blog yet). At $99, this course contains a few hours and covers EVERYTHING a blogger need to know. It’s amazing. Click here to check out the course. Blogger U actually has a TON of awesome courses–ranging from SEO, affiliate marketing, blogging productivity, creating and selling digital products, and way more. You can browse all those courses here. If you’re looking to really make someone happy, these are the drool-worthy gift ideas every blogger (and human) would love. This program is game-changing for bloggers. It covers all the basics of growing a successful blog: content, marketing, email subscribers, traffic…and comes packaged with a world-class support group of bloggers, monthly challenges, meetups, and more. The full bundle comes with ALL courses. Mac-fanatics love their upgrades, and this very blog post is being written from a high-powered 2016 MacBook Pro w/ Touch Bar ($2,100). Expensive but worth every penny (for us). However, the big thing every blogger should care about is the processor, and thankfully you can grab a Window’s based 2017 Lenovo Ideapad for under $300 that has an amazing processor. (Heck the 2017 Lenovo Flagship laptop is a dang supercomputer, and it’s only $588.) Amazing. So that’s that. What else are you getting your internet-obsessed love one? some great ideas here and an equally great post topic! Hi, such a helpful post. Deciding gifts for your friends and family on Christmas is such a difficult task. I have many blogger friends and so I find it hard what to choose for them on their birthdays or Christmas which is going to be equally helpful in their profession. So this is great for me at least. By the way, last year I gifted Salt Lamps for some of my friends and they loved it. These lamps are incredibly beautiful and they are extremely cheap. I also have three salt lamps at my home. I bought them from Saltean, you can check their website for more details if you want. Those lamps are incredible. Such a small and unexpected little thing that proves really, really fun. And you’re correct, for super cheap as well!